As Bob and I were coming near the end of our visit to the George C. Reifel Migratory Bird Sanctuary, we thought we had seen the best of what the protected area had to offer that day, a variety of ducks, Lesser Snow Geese, Spotted Towhees and scores of Great Blue Herons, to name a few, but the best was yet to come. As we rounded a bend in the trail, our eyes fell on several Sandhill Cranes foraging for bits of food in the brilliant sunshine. 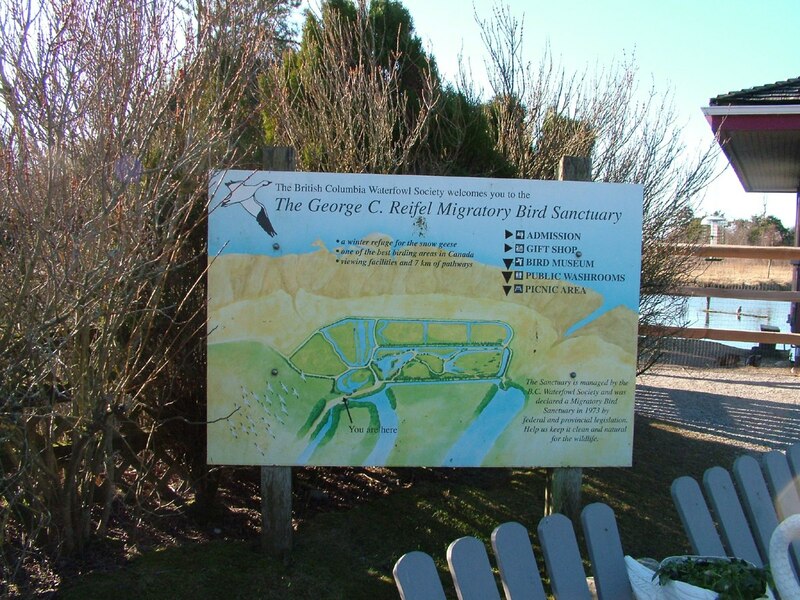 Bob and I found ourselves at the Reifel Bird Sanctuary after learning that it is one of the best places for birdwatching in the Vancouver area. 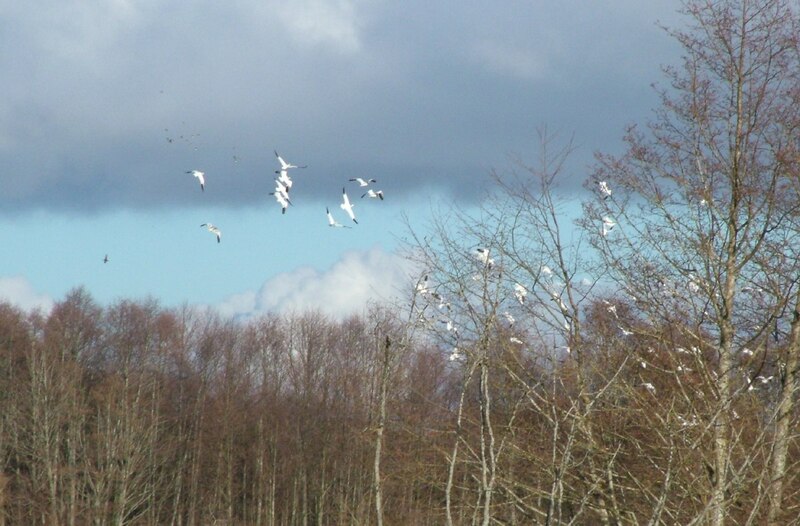 Located on Westham Island in the Fraser River estuary of Delta, British Columbia, it is ideal for migratory birds using the Pacific Flyway. I thoroughly enjoyed touring the sanctuary on the trails along the dykes and through the marshland as they bisected the sanctuary into a myriad of inviting individual habitats that shelter dozens of species of birds and waterfowl. Overhead, a flock of Lesser Snow Geese disturbed the silence with their distinctive calls as they zeroed in on the shoreline adjacent to the Strait of Georgia, but we did not turn our eyes upward for fear of losing sight of the Sandhill Cranes. Reifel Bird Sanctuary was fortunate to have 11 Sandhill Cranes residing there for the winter, but in actual fact, only one pair makes Reifel its year-round home. 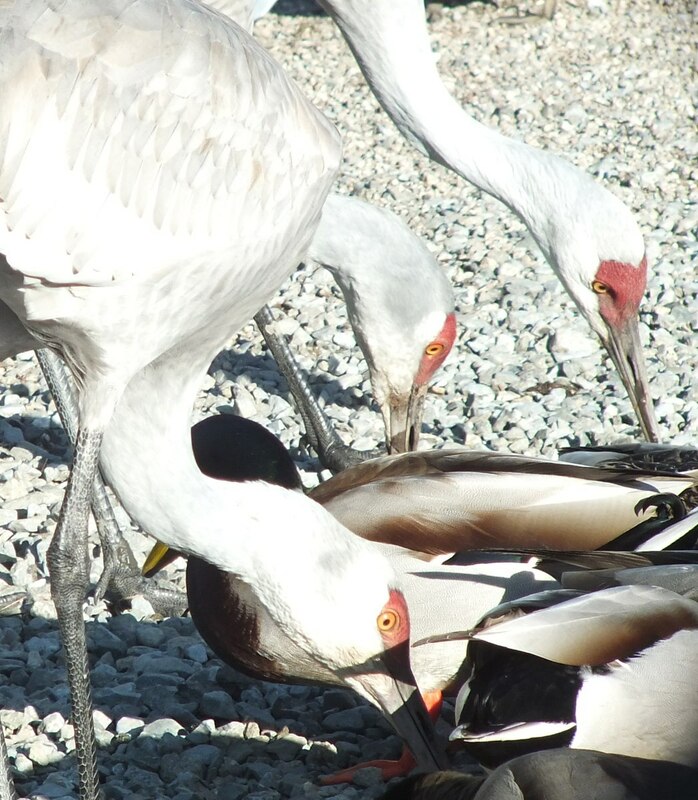 A select small group of Sandhill Cranes visits the sanctuary beginning in late summer to early winter, but usually less than 10 visiting Cranes stay for the winter alongside the resident pair. During migration and over the non-breeding season of the winter months, it is common for families of Sandhill Cranes to form loose flocks with other families and non-breeders, and those flocks will roost and feed together. In some places, a flock will number in the tens of thousands. 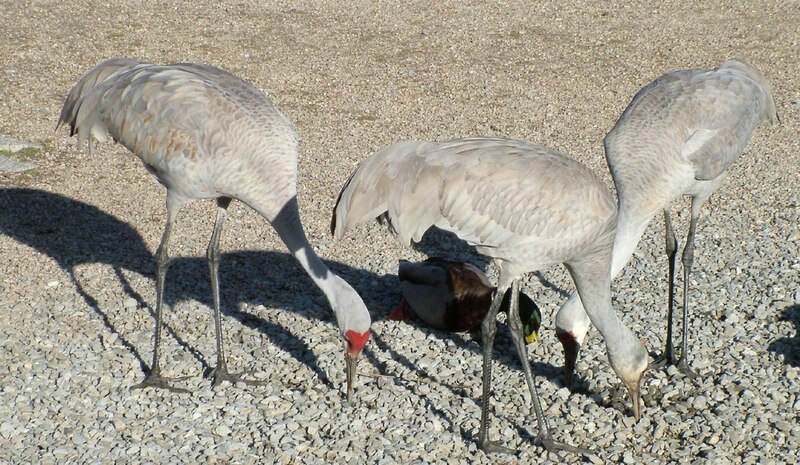 Of the 15 species of cranes in the world, Sandhill Cranes are the most numerous and wide ranging. They are found predominantly in North America, and their range there extends from Cuba as far west as northeastern Siberia. 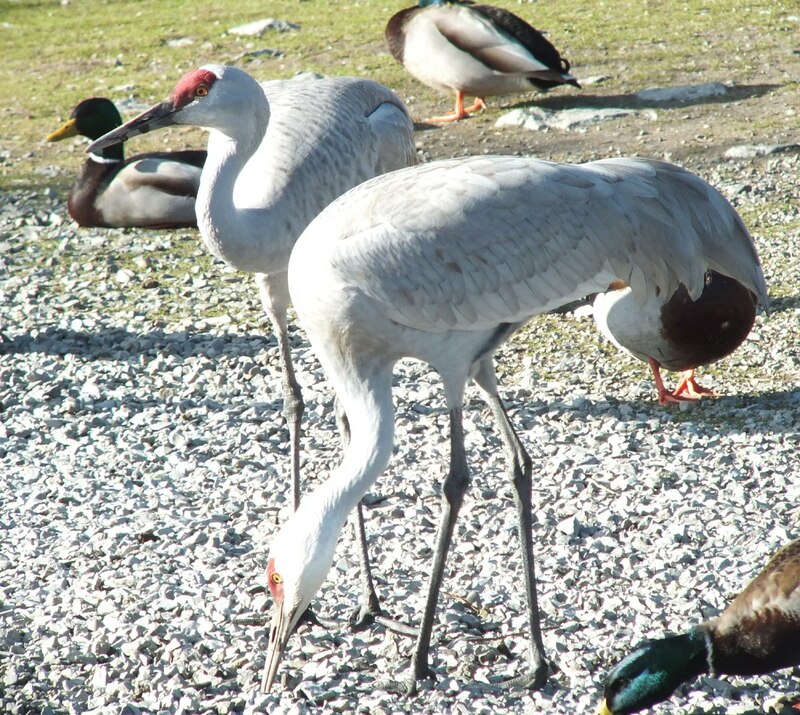 Only once before did Bob and I have occasion to see Sandhill Cranes and that was on April 26, 2013. 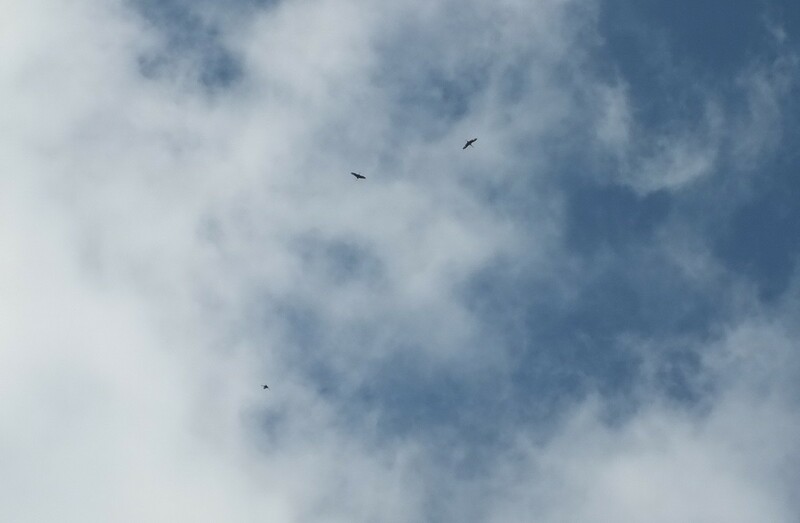 While visiting Cootes Paradise, the largest wetland at the western end of Lake Ontario, in the city of Hamilton, Ontario, Bob spotted a couple of the cranes soaring at a great height above us. The large wingspan of Sandhill Cranes, up to 7 feet wide, means that they are very skilled soaring birds. Sandhill Cranes actually utilize thermal columns of air to gain altitude, just like hawks and eagles do, and can float on high for hours buoyed by the uprising air with only the need to flap their wings occasionally. 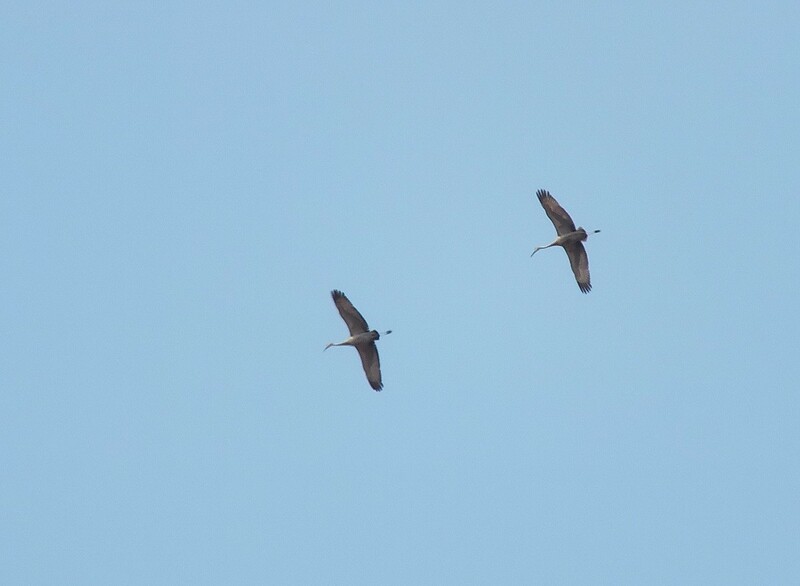 According to the Hamilton Naturalists’ Club, it is fairly common to see Sandhill Cranes in the Hamilton Study Area, only appearing there as migrants, though on seven occasions, they have been recorded there since first being sighted in 1992. 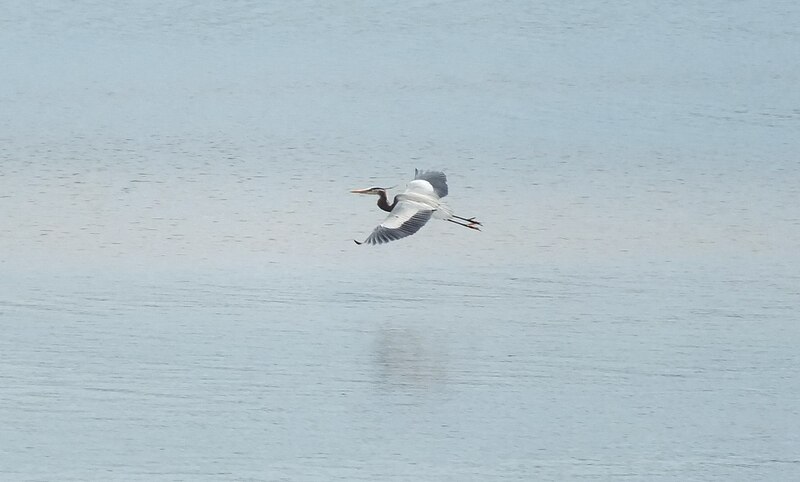 The distinctive posture in flight with their necks extended straight out in front and their legs trailing behind differentiates these birds from Great Blue Herons, which are a similar size. 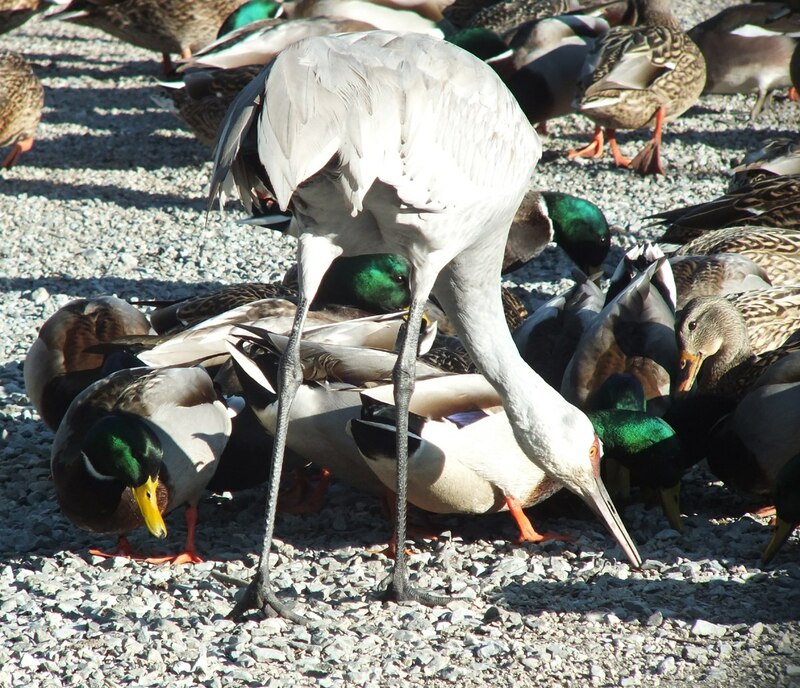 Sandhill Cranes are very tall wading birds that are often confused with Great Blue Herons because of their similar size and shape, but in truth, there are significant differences between the two species. The easiest way to distinguish one from the other is by the head colouring and posture. 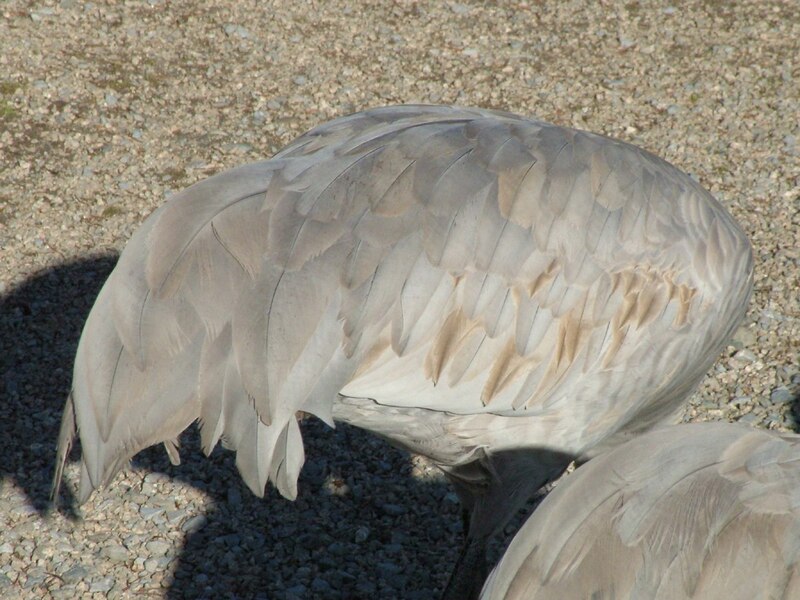 A Sandhill Crane has a patch of bright red featherless skin on the forehead and crown and a long, dark pointed bill; adult birds have white cheeks. 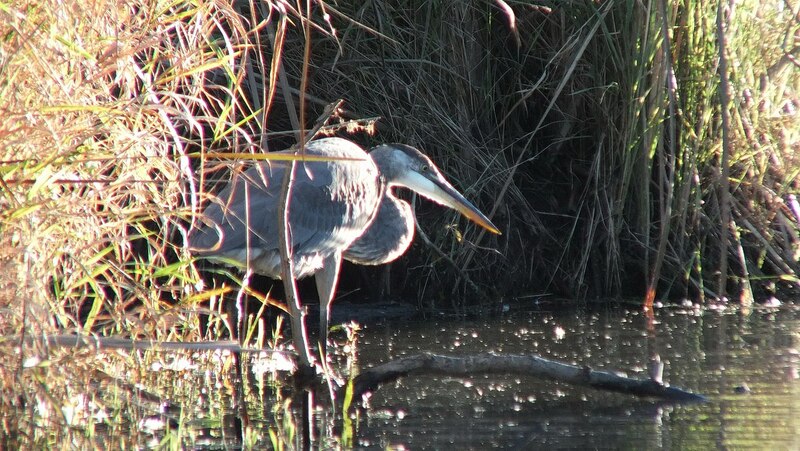 A Great Blue Heron, on the other hand, has a black and white head with a larger yellow bill that is more like a dagger. 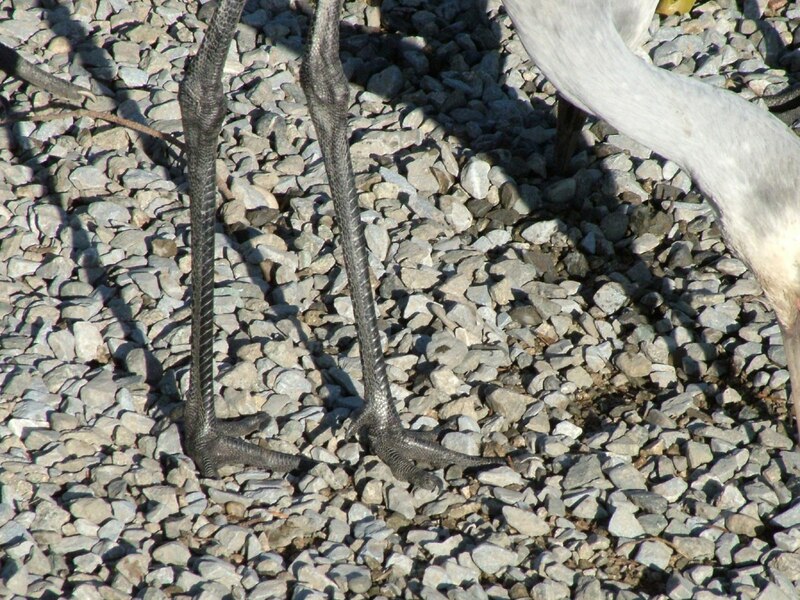 A Sandhill Crane has black legs and toes that trail behind the bird when it is in flight, as already mentioned, but a Great Blue Heron also trails its legs and feet when airborne. It is a Great Blue Heron’s practice of flying and often standing with its neck in a compact “S” configuration, thus putting the head against its shoulders, that is a marked difference from the posture of a Crane. Sandhill Cranes do not hunch their necks that way. 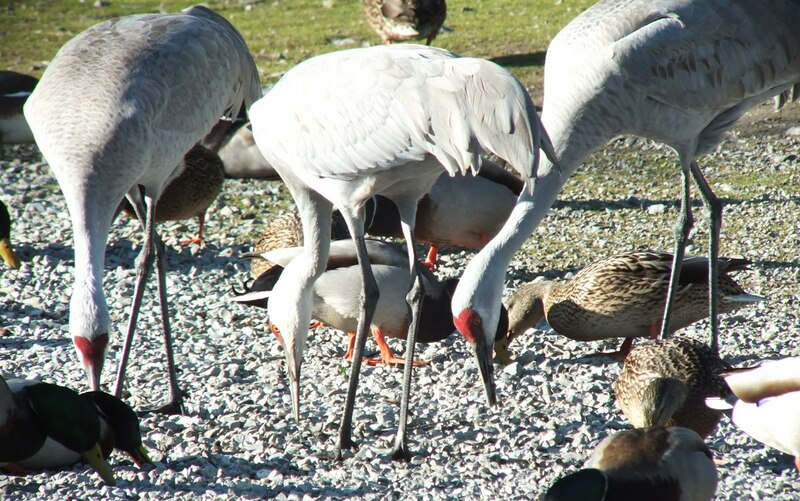 While Bob and I observed the small flock of Sandhill Cranes at Reifel Bird Sanctuary, the birds coexisted with no sign of intolerance for one another. It will be a different story come springtime. 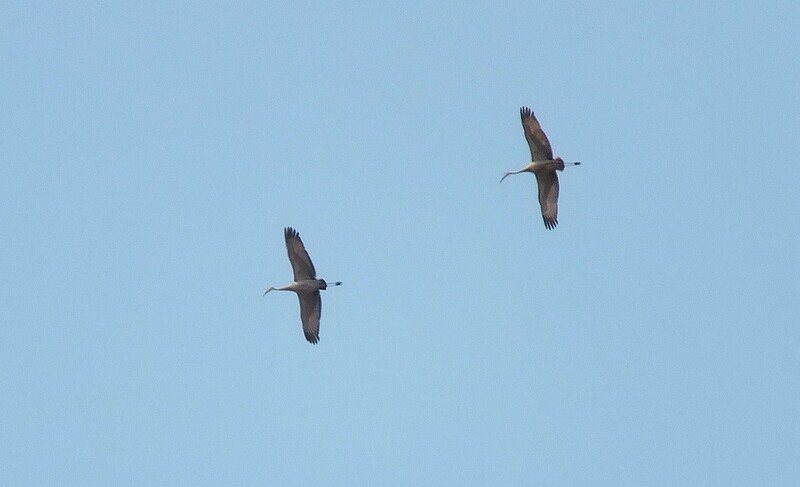 Then, ahead of breeding season, the resident pair of Sandhill Cranes will chase away all other cranes and actively defend the 300-hectare Sanctuary as its own territory. Although Bob and I were able to get relatively close to the Sandhill Cranes as they calmly mingled with a flock of Mallard Ducks, we would have a totally different experience during breeding season. 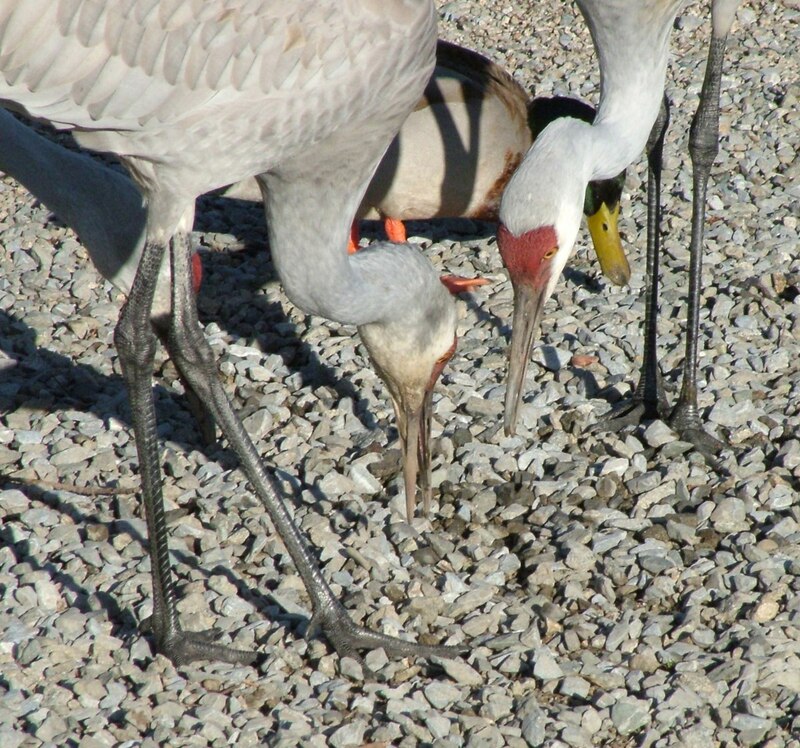 At that time, the Cranes are apt to attack visitors to the Sanctuary if a threat to the nesting site, a mate or the young is perceived. 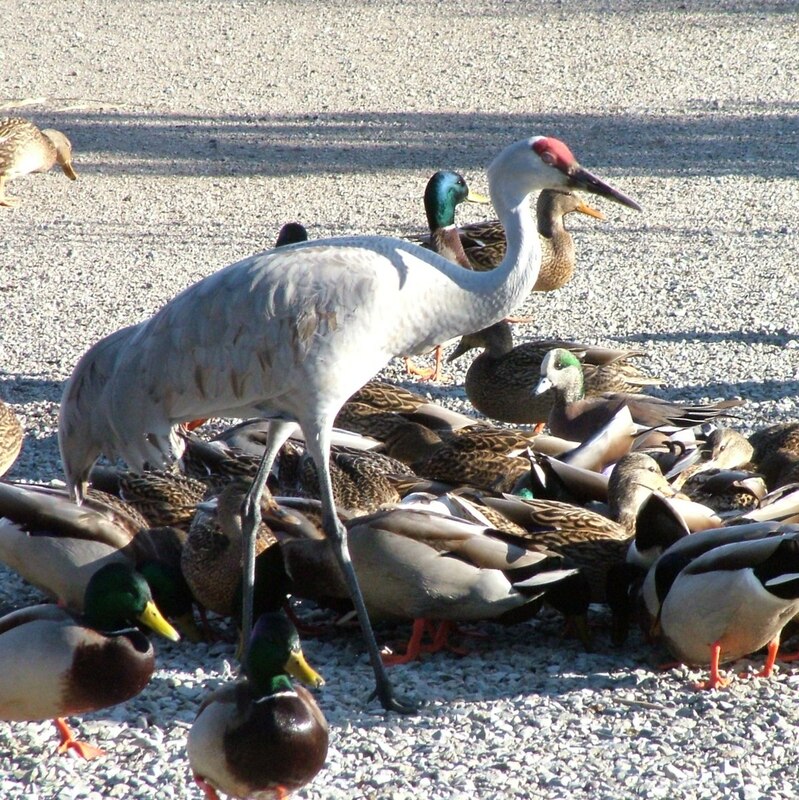 Sandhill Cranes are very protective. Sandhill Cranes sometimes have a reddish-brown appearance because they preen themselves using iron-rich mud. The mud is rubbed onto their feathers, which subsequently take on a temporary deep rusty hue. 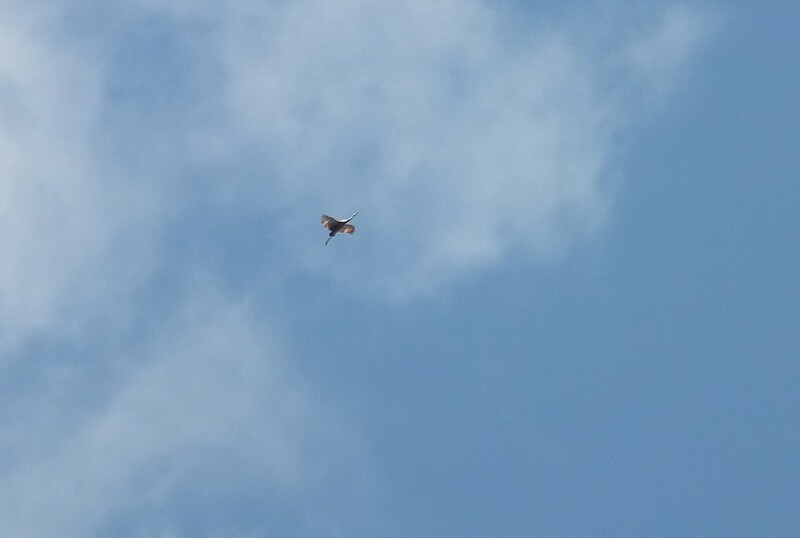 This is commonly seen during the spring and summer. By fall, the feathers molt, and the birds return to their delicate slate grey appearance although the plumage may retain a rusty wash on the upper parts of the body. Sandhill Cranes have earned their name from the Sandhills of Nebraska because that is where over 500,000 of these birds congregate each year during migration. Nebraska’s Sandhills, the largest sand dune formation in the western hemisphere, consist of over 50,000 hectares of sand deposits from the past ice age. It is there that about 80% of North American Sandhill Cranes converge on the Platte River basin to prepare for the return flight to their breeding grounds in Canada and Alaska. Bob and I took great delight in the opportunity for such close study of the elegant Sandhill Cranes. Who knew that these graceful birds are thought to be the oldest known bird species surviving on Earth? 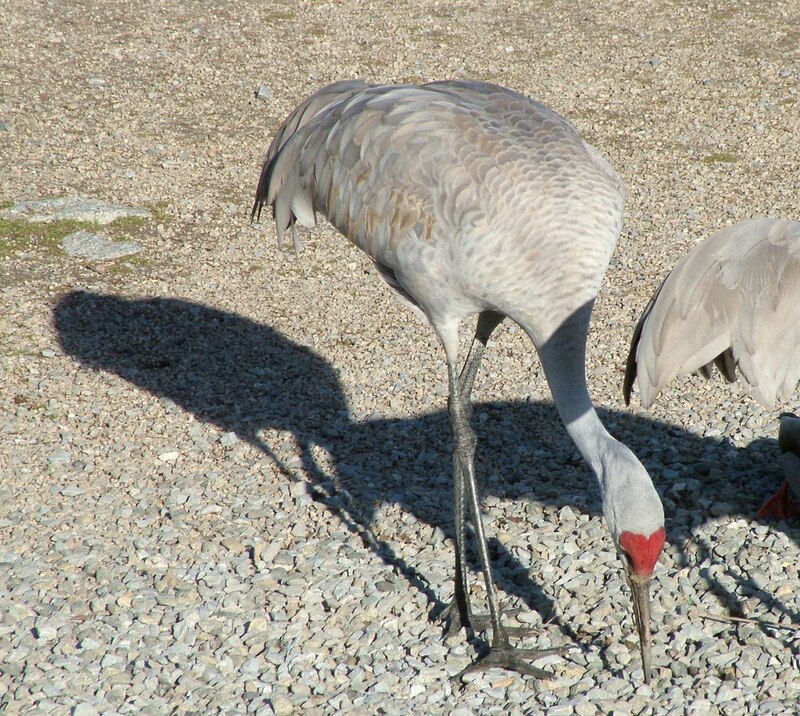 A crane fossil from ten million years ago, found in Nebraska, was found to be structurally the same as the Sandhill Cranes of today. How cool is that?